PRIOR to the Northern Ireland Assembly election the DUP tried to delay publication of information linked to the £435,000 it received from pro-Brexit lobbyists, emails have revealed. A summary of EU referendum campaign spending was published by the Electoral Commission a week ahead of the March 2 Assembly election. The DUP publicly welcomed transparency over the issue, as well as volunteering the name of its donor, but private correspondence reveals it argued against releasing the expenditure information ahead of polling day. 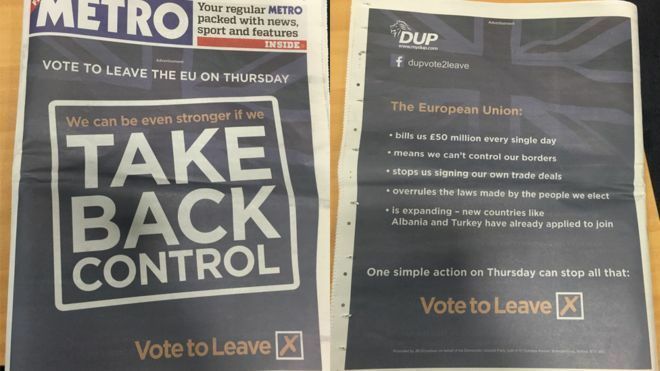 Before the UK’s referendum on EU membership in 2016 the DUP took out an £282,000 front cover wraparound advert reading "Vote To Leave EU" in the Metro newspaper in Britain. The party faced pressure at the time to identify the donor that funded its campaign, but political donations given to parties in Northern Ireland are kept confidential for security reasons. On February 24 this year, the Electoral Commission published details on the UK referendum campaign, revealing the scale of spending by the DUP. On the same day the DUP accounted for the level of expenditure by volunteering that it had received £435,000 from a group of pro-union business people led by a Conservative party member. However, The Detail news and analysis website has obtained emails revealing a number of interventions by the DUP calling for a delay in publishing its spending returns, including correspondence with the Electoral Commission’s Chief Executive Claire Bassett. An email listed as being from the DUP’s chief of staff at Westminster was sent to Ms Bassett in February following press reports on the commission’s plans to publish campaign spending information. The DUP email stated: “We’ve noticed in the press various stories to the effect of, ‘the EU Spending returns are soon to be published by the Electoral Commission’. Our friends in the media frequently get things wrong, not least when it comes to their coverage of hard-pressed regulators. But we’d obviously like clarity on this point please. Four days before the release of the information, an email sent to Ms Bassett by the DUP’s Sir Jeffrey Donaldson asked that publication be postponed for a week to “avoid interfering with the Northern Ireland Assembly elections”. The email sent by the Lagan Valley MP on February 20, 2017, which was copied to his party deputy leader Nigel Dodds, stated: “The DUP considers that the publication of politically-sensitive material in the week before polling day by the commission would be unprecedented and undercut established rules designed to ensure public bodies do not intervene in election campaigns. A spokesperson for the DUP said it did not want to add any further comment regarding the correspondence, which was obtained using Freedom of Information legislation. Click here to see the full contents of the Elecotral Commission's response to our FOI request published on the commission's website. On February 24, the Electoral Commission published details of all campaign spending in excess of £250,000 during the referendum campaign. On the same day, the DUP announced the party had received a Brexit donation of around £435,000 from an organisation called the Constitutional Research Council. Little is known about the organisation other than it is chaired by Richard Cook, a former vice chairman of the Scottish Conservative and Unionist Party. The DUP confirmed that £425,000 was spent on the Brexit campaign, including £282,000 on advertising in the Metro newspaper in support of Brexit. On February 23, 2017 The Detail sent a Freedom of Information request to the Electoral Commission asking for all correspondence it held during the last six months that made reference to the publication of details on the DUP’s EU referendum campaign spend. 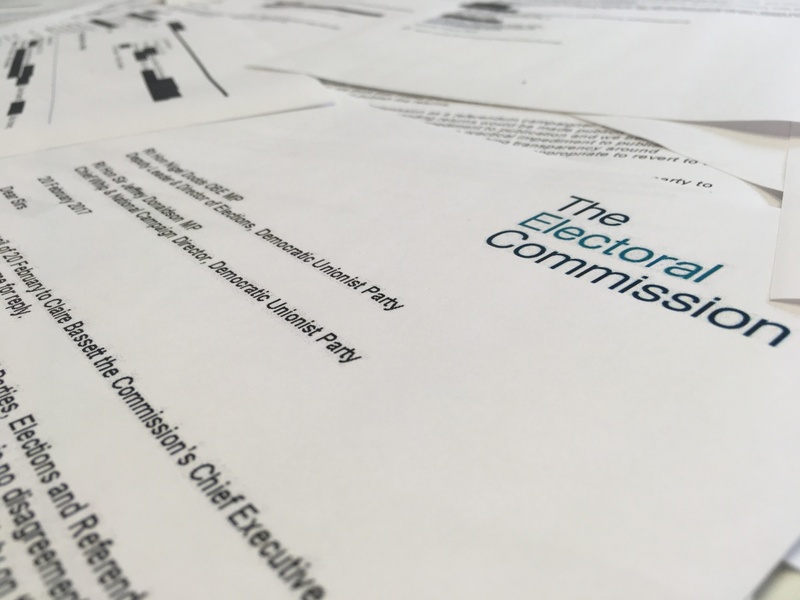 An internal email from a member of the Electoral Commission’s media department provided details on the planned publication of spending returns of over £250,000 during the EU referendum campaign. The email referred to a meeting outlining that this would likely occur in mid February and noted that this would include the DUP’s return. It stated: “We agreed the election should not delay publication." Another email from the Head of the Electoral Commission for Northern Ireland Ann Watt outlined that the DUP had already asked for the appropriate contact details within the commission to raise the issue of publication of EU referendum spending returns. In her internal correspondence to colleagues she outlined that the commission may face rival calls from parties to either delay or to publish spending information. Her email stated: “All - we need to be aware that there may be a strong push-back from the DUP (and possibly others) about our plans to publish the EU referendum spending returns on Friday 24, February, given that it is six days before the NI Assembly Election. She added: “Obviously we would be challenged from the opposite direction if we postponed the publication of these returns until after the NI Election. So my point is only that we need to have our eyes open about the likely challenge when we publish on Friday 24th”. An email was then sent by the DUP on the same day to the Chief Executive of the Electoral Commission, Claire Bassett. The name of the DUP official was redacted stating only that they were the party’s chief of staff at Westminster. The email from the DUP’s chief of staff at Westminster stated: “We’ve noticed in the press various stories to the effect of, ‘the EU Spending returns are soon to be published by the Electoral Commission’. Our friends in the media frequently get things wrong, not least when it comes to their coverage of hard-pressed regulators. But we’d obviously like clarity on this point please. The Electoral Commission’s Chief Executive Claire Bassett replied to the DUP’s email. She acknowledged the party’s concerns but pointed out that the Electoral Commission had a statutory duty to publish EU referendum spending returns as soon as is practicable. The email stated: “At the rate of progress we are making in processing the returns so they can be made publicly available, we think that Friday 24 February is likely to be the earliest reasonably practical date on which we can publish the returns. DUP MP Sir Jeffrey Donaldson sent an email to Ms Bassett inviting the Electoral Commission to reconsider its decision on publishing referendum spending returns less than a week before the Assembly elections. In the email Mr Donaldson put forward a number of legal arguments. He stated: “The duty is not to publish the returns as soon as practicable, but only as soon as reasonably practicable. It is settled law than an obligation to do something when ‘reasonably practicable’ is not contravened if there is ‘just cause or excuse’ not to do it in the specified time: Wall’s Meat Co Ltd V Khan  ICR 52, 56D. In concluding the letter Mr Donaldson stated: “The DUP considers that the publication of politically-sensitive material in the week before polling day by the commission would be unprecedented and undercut established rules designed to ensure public bodies do not intervene in election campaigns. A letter is sent by Bob Posner, the Electoral Commission’s Director of Political Finance and Regulation and Legal Counsel, in response to Jeffrey Donaldson’s email. It stated: “In reaching a decision to publish we have considered the timing of the forthcoming poll in Northern Ireland. We have not in the past regarded delaying publication in the lead up to elections as justified or excusable. We consider our objective of transparency for voters of political finance is consistent with the holding of fair elections. Click here to see The Detail's previous coverage on the issue of political donations in Northern Ireland.